Wisdom of Life. 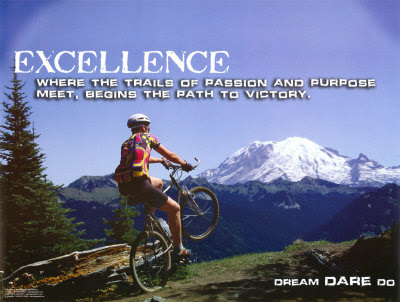 : What is excellence? There was this small unknown restaurant called Foo's House, in Singapore where it served the best delicious western food. The owner was once the famous chef for a Five Stars Hotel who had the honour to prepare a special White Salmon meal for the Queen when she last visited the island. I was taken to a dinner by my son at this place where i had the opportunity to taste this Queen's special for the nite. Wow! It was fabulous and the price was also reasonable. Next! I was given a tasty cheese cake which was sold by an unknown cake shop in Bangsar. If you had the chance to see this shop, it doesn't display much of their advertisement. No fresh cake or sample could be seen. All their cakes are kept in boxes ready to be dispatched. The only buyers are the neighbours or those who know the qualities of their products. According to feedback, the demand exceeds their making almost everyday. Both the restaurant and cake house are managed by the owners who cooks and bakes their food behind their kitchen. My son and friends asked this question; "Why aren't these famous cook and baker open more shops to expand their ready market?" I told them in simple term. They are just like Robert Foo who loves his hobby selling life insurance and not the least be bother to look at monetary return. Their passion over their profession is enough to keep them going in life. What is excellence? The desire to excel is exclusive of the fact whether someone else appreciates it or not. "Excellence" is a drive from inside, not outside. Excellence is not for someone else to notice but for your own satisfaction and efficiency.